Thanks Patrick, really enjoying this build. It's a modular 3 piece build. 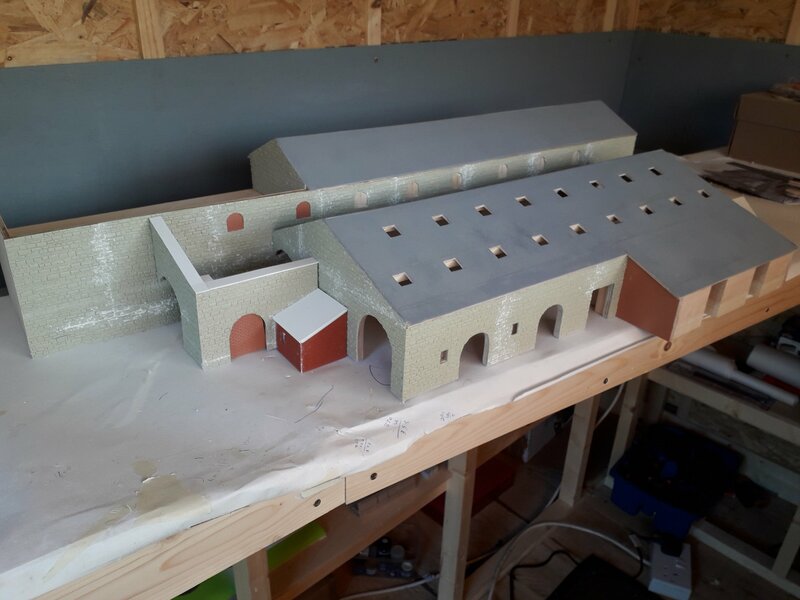 Today I primed the roof as I want to start some work on this early next week. What's the best finish available for corrugated asbestos roof? Is Slaters too thin or is Wills better thickness? Slayers is thin and Wills is thick. 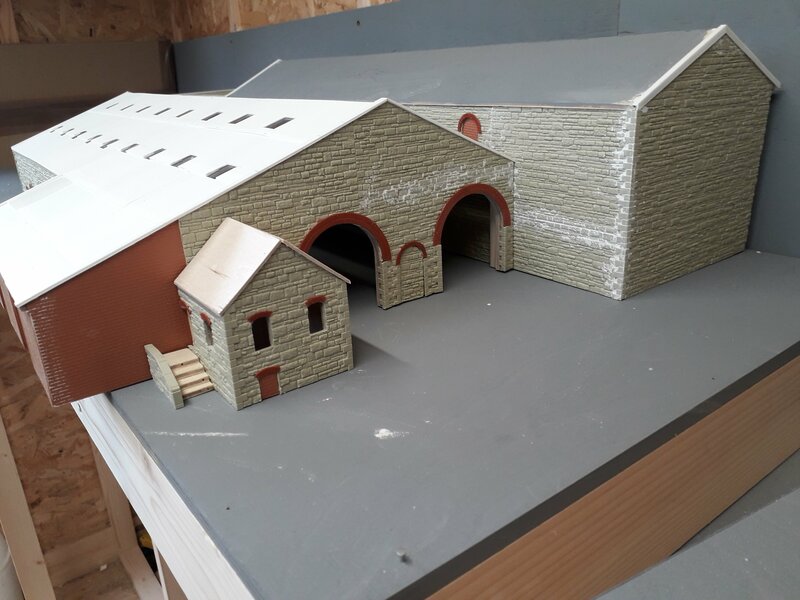 Indeed, I use Wills asbestos for 7mm scale wiggly tin. The best stuff is made by Ambis Engineering, so worth Googling, as this project is to a high standard and deserves the best. 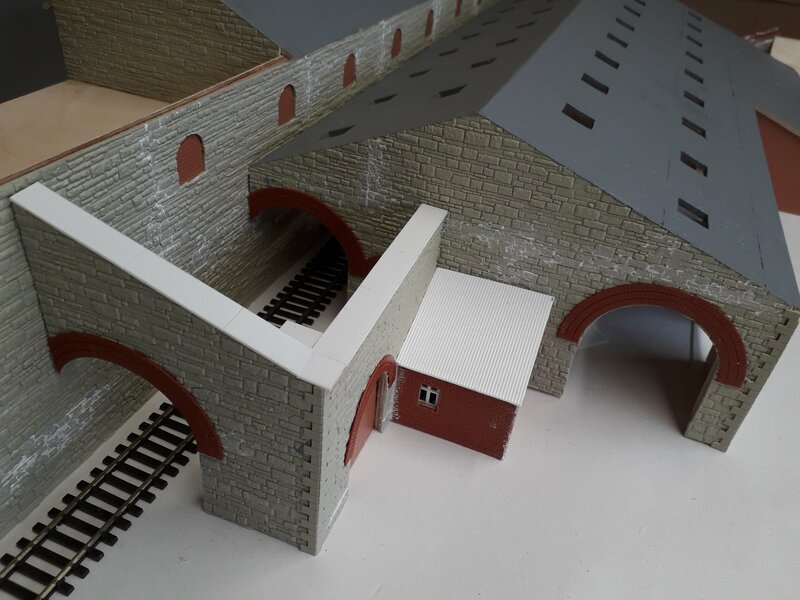 Something worth noting if you are planning on using Wills Red Brick headers over arches. Although Omagh had three brick headers over all arch openings, Wills brick headers appear to be over-sized and look out of place. Acting quickly before my adhesive totally set, I removed these headers and reduced them to two brick headers, as can be seen below. 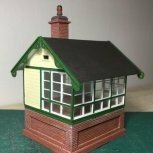 Tomorrow, the Carpenter at Omagh GNRi station Is calling to check the finer detail of this build with me. He repaired many of the sheeted doors in the Goods store and repaired the roof many times. 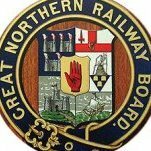 He went on to work as Clerk of Works with the lifting train squads at Omagh. 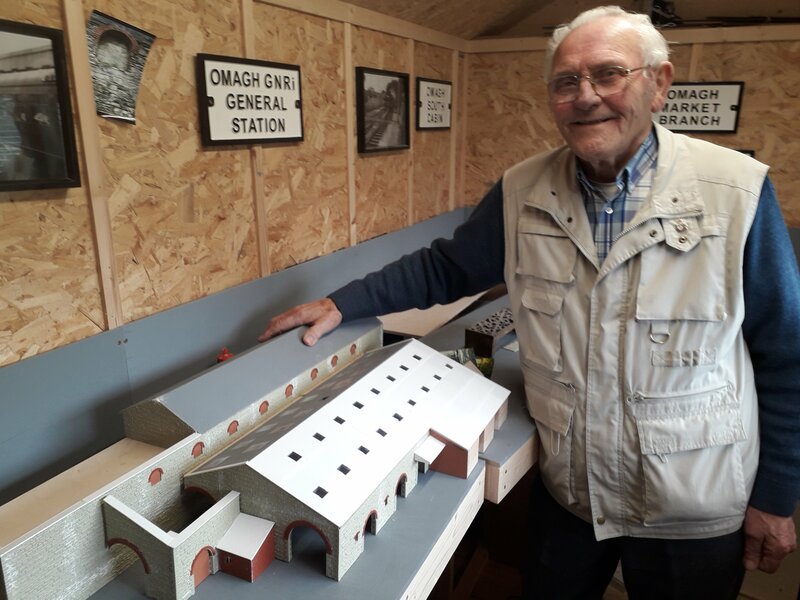 Today, ex-GNRi carpenter Billy Caldwell called to check out my model of the Goods store. He talked in detail of how he worked with a squad of tradesmen 1954-55 to lower the entire roof of the building. He gave me a commentary of the 'goings on' inside when Omagh was a busy mainline station. 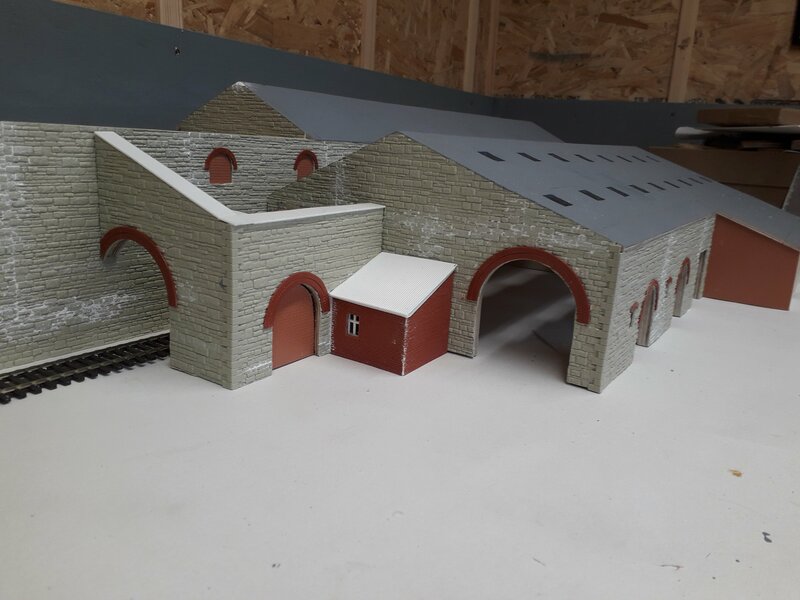 According to Billy, the model is very exact! That is nice - even the currently visible white marks from the filling would look quite prototypical where I live, on the edge of the salt fields. Broithe, this is all pre-paint. Will be grey in the end. 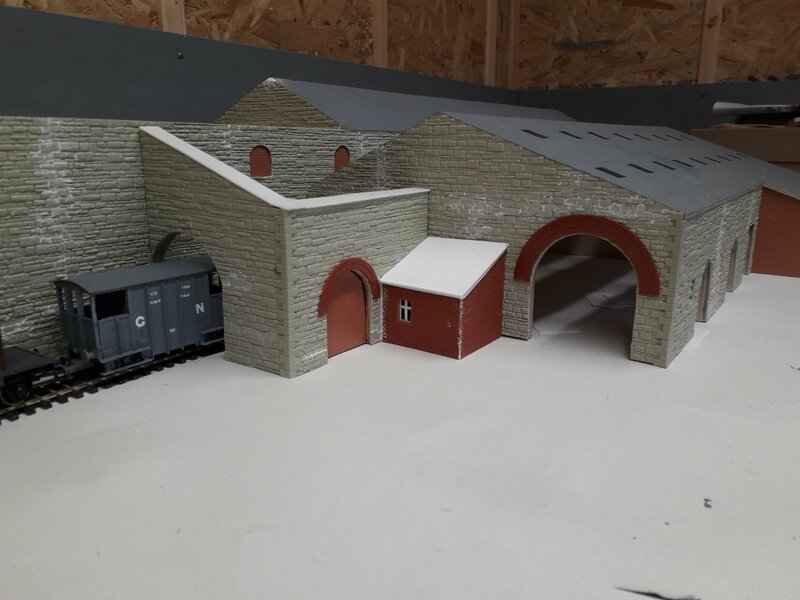 Very impressive shed Tony, certainly a center piece for a diorama in its own right. 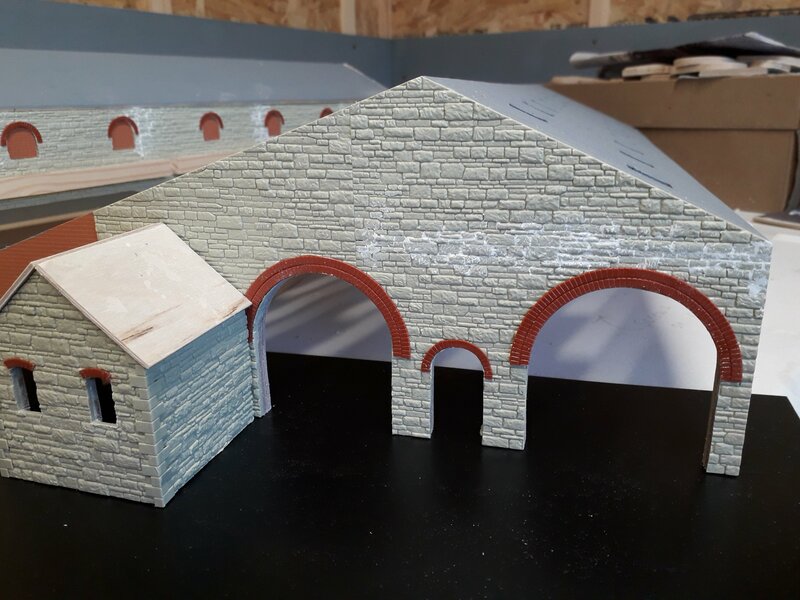 I have used the Wills stone sheets for smaller buildings and generally brush paint the building in a dilute light grey to pick out the mortar joints and then paint the stone work with a dry brush technique. This is a very nice example, Thanks for posting. My plan was to run a light grey into the joints and pick out the individual stones with various shades as illustrated in the picture I took of the original store below. Although this one is b&w, I did take many colour shots too. 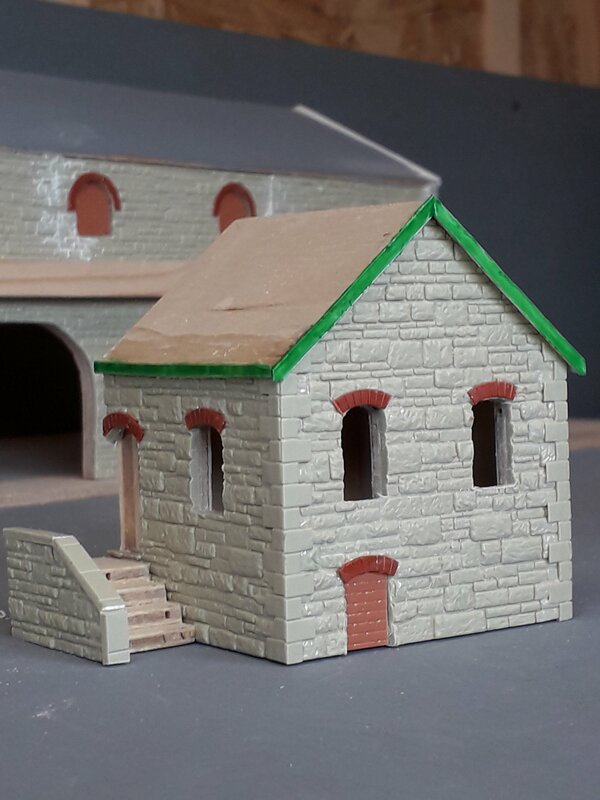 I think there are basically two ways of painting buildings - mortar colour first and then pick out each stone, or put a general stone colour on first and add the mortar as a dilute wash. 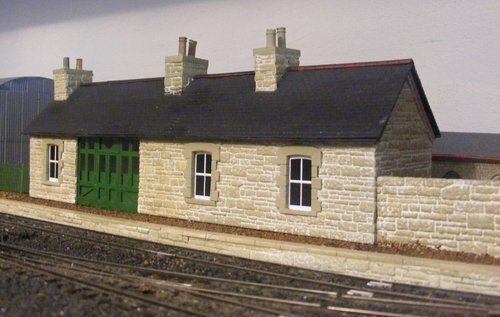 The latter is the technique used by scenic master Martyn Welch (The Art of Weathering). The stones can be done in a semi 'dry brush' method, when you skim the top surface with a broad, flat brush, sponge, cloth or what ever. Much depends on whether the stone is a uniform colour or a variety of shades. Once dry, probably 48 hours with enamels, the mortar colour used should be a very dilute mix. 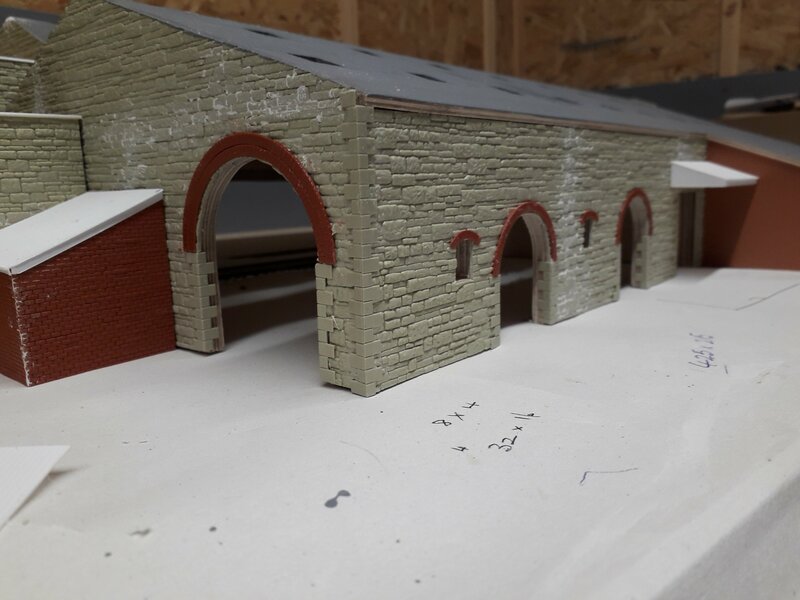 The trick is to hold the model at about 45 degrees and, using a largeish, flat brush, well loaded with paint, touch the brush at the top of the model - the paint will then run down all the mortar lines by capillary action. Repeat as required, down and across the building. Any paint on the stones themselves can easily be wiped away. Having tried it myself, it became the usual method for Arigna Town's stonework, though as always, best to test on a scrap piece first. David, very helpful tips there. Do you recommend acrylic or oil based enamels? What ever you prefer, to be honest, Tony. Or even, what you have in stock. Either will work well, but do suggest you practice on a piece of scrap first. Lorries reversed into the Goods yard through various entrances. This one was one of a couple that Scott's Mill used to pick up bags of loose grain. It really is an impressive model. 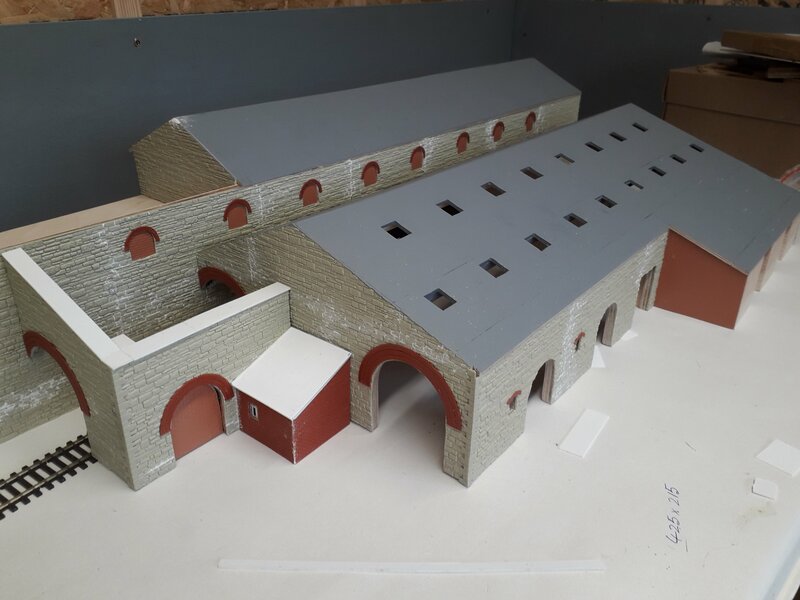 What are the overall dimensions? The overall footprint is around 1200 x 550mm and this was taken from the original Dundalk engineers drawings. 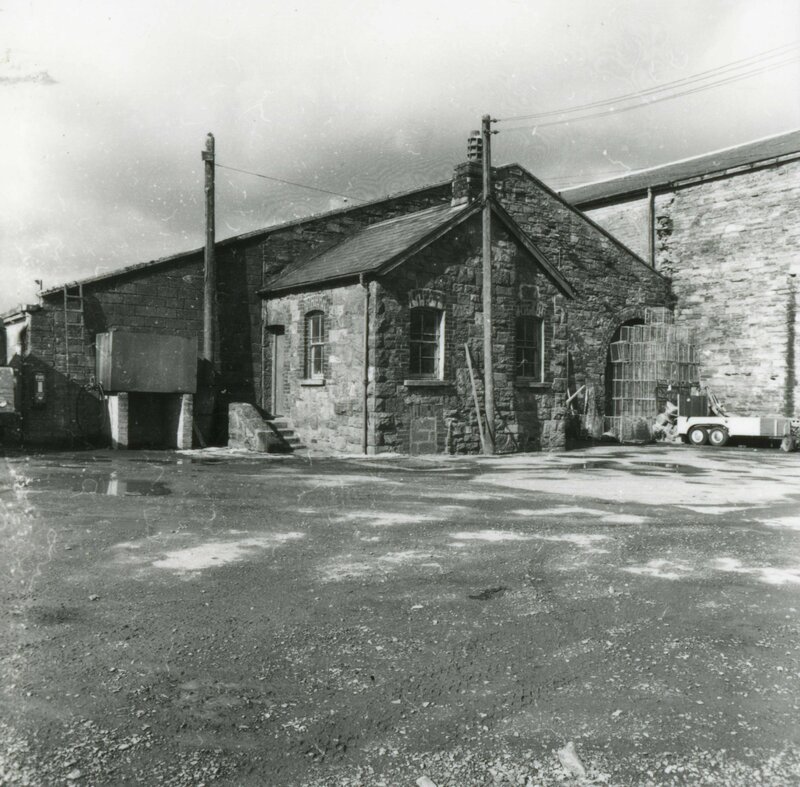 As stated earlier, some alterations were made to the roof when the height was greatly reduced in 1955. Over the years some arch openings along the side were built up with stone from the reducing work in an attempt to secure the building. The huge sheeted doors were pulled at night to close the rear and front access to the store interior. 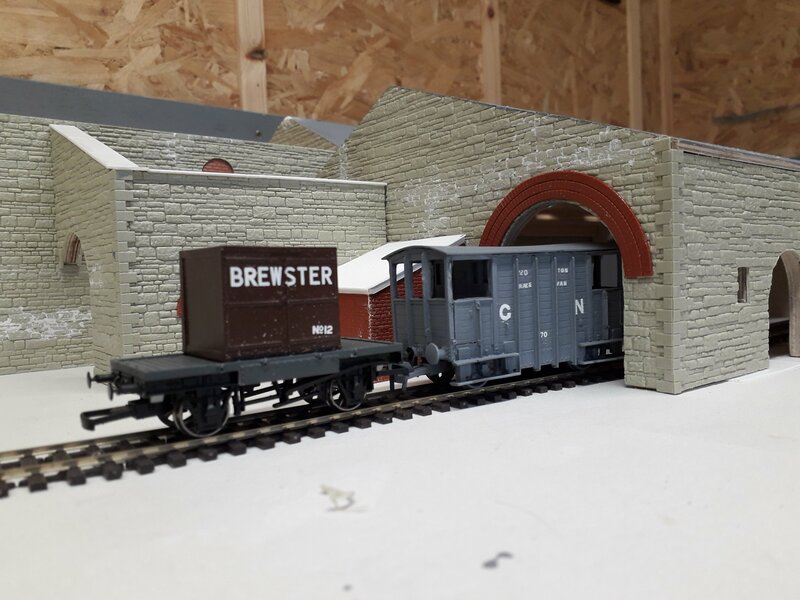 It will make for a small shunting project but I believe, with only 2.8metres aavailable in total it will lend more towards a diorama than actual layout. It has generated much interested locally from the few surviving GNRi staff in town. This pleases me more than anything. Not surprised! A working diorama sounds good to me. Can see a lot of invites across the exhibition circuit - accurate, historical scenes like this are always popular and generate a lot of conversation, nostalgia etc. It'll be great to see your UG slowly pushing vans in and out of it! Took a step back today and primed the entire build with Halfords grey primer. The enamels were not taking to the plasticard very well. Top level modelling. Great detail. 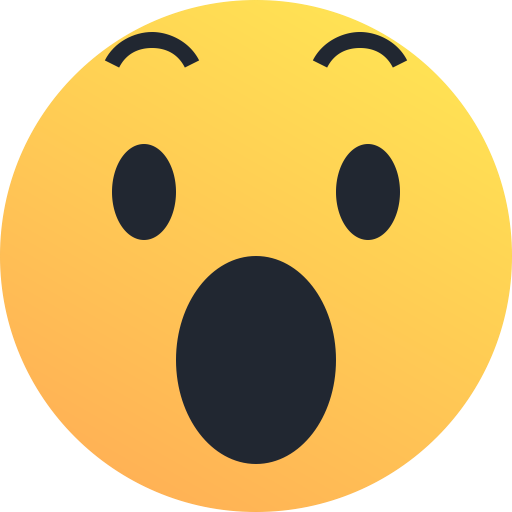 The local press are coming next week! You asked about doing guttering in another thread, Tony. An effective compromise I have used for years is not to bother with hollow section guttering. It can barely be seen in 7mm scale, so must be pretty much invisible in 4mm. Instead, use a strip of plastic of the right thickness and simply sand/file the front, visible edge to the profile you want. Make the strip wide enough so you can glue it to the wall, just below the roof, so it sticks out just below the tiles, slates etc. Where the ends of this guttering are visible, profile both sides of the strip, though you only need to do a couple of cm against the wall side. The rest can't be seen. Simple and effective, because the square, rear edge of the strip is easily glued to the wall and the underside will not be seen from any normal viewing angle. All Arigna Town buildings and those on Fintonagh have been done this way.